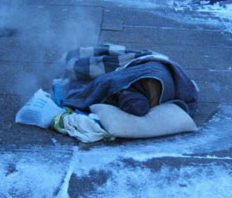 The City of Peterborough Social Services Division, St. John’s Anglican Church, George St. United Church, All Saints Anglican Church and CMHA-HKPR are teaming up to open the Warming Room Program, which will provide overnight mats for vulnerable people in the community. The program will operate from November 20th, 2013 to March 2014, and offer an alternative for individuals not able to stay at existing emergency Shelters. Volunteers will refer individuals who attend the warming room program to appropriate social service agencies for follow up supports. The Warming Room Program will open on Wednesday, November 20, 2013 at All Saints Anglican Church on Rubidge St. The program will operate each Sunday, Monday, Wednesday, Thursday and Friday from 6:00 p.m to 8:00 a.m., with another location to be announced for Tuesday and Saturday nights. A number of volunteers have already been screened and received training from CMHA- HKPR. More volunteers able to help at the program overnight are needed. Volunteers must have a Vulnerable Sectors Police Check. Forms can be obtained at the Peterborough Lakefield Police Services office or the Ontario Provincial Police office for County residents. If you are interested in volunteering, or if you wish to donate sheets or blankets to the program, contact Rebecca Butler via email or call Christian Harvey at St. John’s Anglican Church at 705-745-7624. Much needed donation items include: twin sheets, blankets, pillows, games, cards, coffee, paper towels, snacks, cleaner for mattresses.